The Brick Township Board of Education has extended the contract of interim Superintendent Richard Caldes until June 30, essentially the end of the 2015-16 school year. 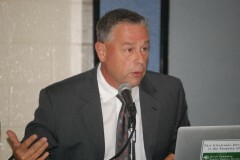 The contract extension was unanimously approved, except for board member Michael Conti, who was not at the meeting. There were no changes in the salary. Caldes will earn the equivalent of a $177,468 salary while serving as interim superintendent, just shy of the state-allowed maximum salary of $177,500. He will retain the duties he had in his previous position of Educational Specialist. Caldes is serving in the position as chief schools administrator in the absence of Superintendent Walter Uszenski, who has criminal charges pending against him.